The Parana andUruguay rivers flow south through Argentina and along theArgentina-Uruguay border to empty into the Rio de la Plata and thesouthern Atlantic Ocean in this true-color Aqua MODIS image from January26, 2002. Because of the relative calm surface of the Rio and the angleof the Sun relative to the MODIS instrument, it is possible to see thecurrent of the river flowing out into the Atlantic, visible as acoffee-brown and black streak against the tan and gray-blue surroundingwaters. Also visible is the city of Buenos Aires, Argentina’s capitaland one of the biggest cities in South America. 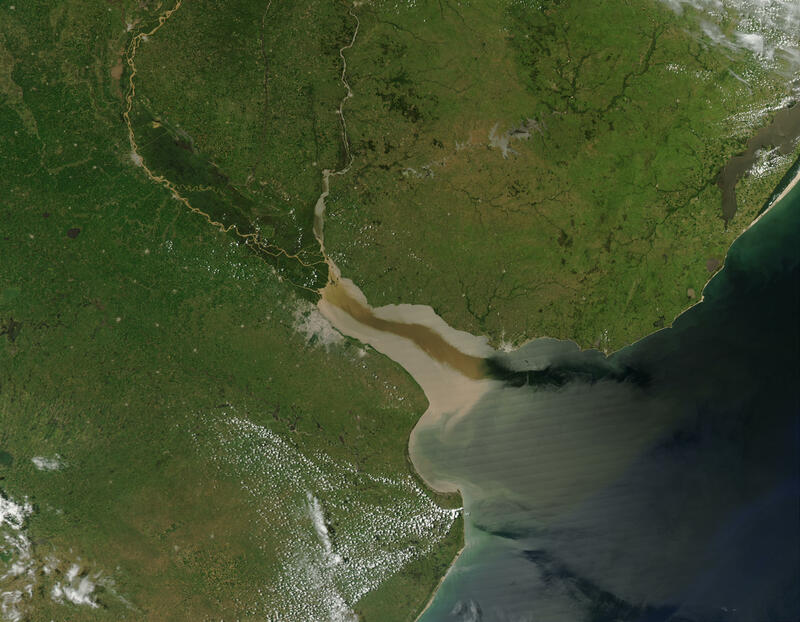 Buenos Aires sits on theupper southern side of the Rio, very near the mouths of the Parana andUruguay rivers, and is visible as a large, spidery shaped gray patch. Uruguay’s capital city, Montevideo, is also visible on the Rio,appearing as a spidery, though smaller, gray patch about parallel withBuenos Aires on a southern tip of Uruguay. It is just north of where theRio’s current turns from coffee-brown to a black color.